2017 promises to be one of the most exciting seasons of footy in recent memory. There are probably 16 clubs with legitimate aspirations of, come September, giving the finals a big shake up the way the Dogs did last year. This week we see that Home Sweet Home has the highest Disagreement Index (readers from last year will know that this is completely unsurprising), and that disagreement levels are generally high as the Tipsters are split 5-4 in three of the games, and 7-2 in two more. 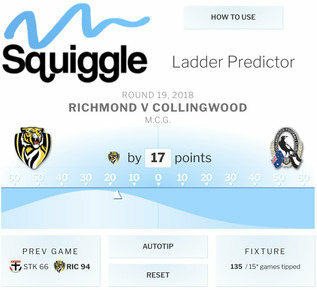 Source: 2017 – Round 1 : Is This Thing On? Hey guess what? That new recruit you think is really good… yeah well this model (and other ELO models) don’t see things like that. Principle is every team has a 36 player list. One player falls, another rises to take their place. And really, everyone thought Adelaide would suffer without ‘Danger’ and the finished as defeated semi finalists. And there are fresh articles on Expected Wins and Expected Finish for each team as well. Next PostNext How impressive was Dusty’s game?